Is Jupiter Eating Its Own Heart? Jupiter is the victim of its own success. Sophisticated new calculations indicate that our solar system's largest planet, which weighs more than twice as much as all of the others put together, has destroyed part of its central core. Ironically, the culprit is the very hydrogen and helium that made Jupiter a gas giant when the core's gravity attracted these elements as the planet formed. The finding suggests that the most massive extrasolar planets have no cores at all. 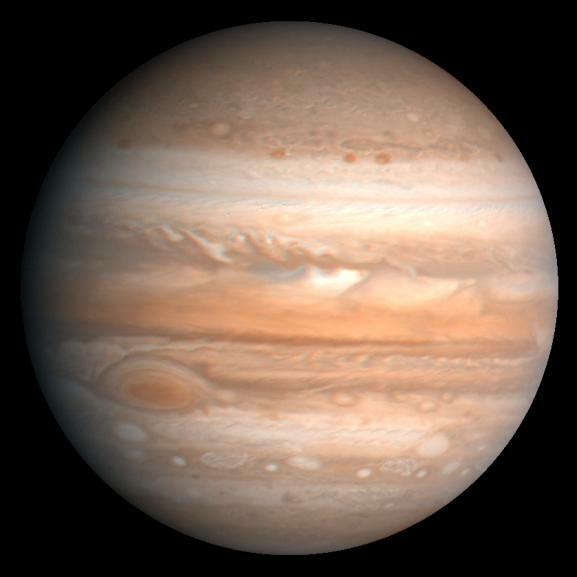 Astronomers call Jupiter a gas giant because it consists mostly of hydrogen and helium, which are gases on Earth. On Jupiter, however, enormous pressure from the planet's gravity squeezes most of the hydrogen into a metallic fluid that conducts electricity. The hydrogen and helium surround a central core made of iron, rock, and ice. The core, which weighs roughly 10 times as much as Earth, is a small component in a planet that weighs 318 Earths. Now planetary scientists Hugh Wilson and Burkhard Militzer of the University of California, Berkeley, have performed quantum mechanical calculations to see what happens when magnesium oxide (MgO)--a key ingredient in the rock of Jupiter's core--is submerged in a hydrogen-helium fluid at the planet's heart. The temperature there is approximately 16,000 Kelvin--hotter than the surface of our Sun--and the pressure is about 40 million atmospheres. These conditions are so extreme that no experiment can reproduce them. According to the team's calculations, magnesium oxide had very high solubility. That means the solid rock in Jupiter's core is dissolving into liquid, as the researchers report in a paper submitted to Physical Review Letters, though the exact rate of erosion is unknown. Wilson and Militzer had earlier calculated that the ice in the core also dissolves. Thus, Jupiter's present core may not be as large as it was when the planet formed. Planetary scientist David Stevenson of the California Institute of Technology says the new work is important, because scientists want to understand how Jupiter has changed over time. "If we can do that, then we can make a very useful statement about what Jupiter was like at genesis," Stevenson says. "Did it have a substantial core at that time? If so, was it 10 Earth masses, 15, 5?" In 2016, NASA's Juno spacecraft will begin orbiting Jupiter and provide data on the planet's present-day interior by measuring its gravitational field. Jonathan Fortney, a planetary scientist at the University of California, Santa Cruz, also calls the new work very important. But a big question remains, he says: is convection in Jupiter's interior vigorous enough to dredge up dissolved core material and toss it into the hydrogen-helium envelope? If so, then Jupiter's core is smaller today than it was at birth. If not, then the dissolved rock and ice will simply remain at Jupiter's center, but the boundary between the core and mantle may be less distinct than had been thought. Still, says Fortney, "I think we've made much more progress in the past year than people had made in the previous twenty years," thanks to Wilson and Militzer's calculations. Those calculations have implications far beyond Jupiter. Many of the planets orbiting other stars are more massive than Jupiter, so their cores are even hotter. "For these planets, core erosion would be faster," says Militzer, which means gas giants several times heavier than Jupiter might be completely coreless, changing the view scientists have long held of these distant worlds.